The first thing you do when you get to a restaurant is read their menu. This can help you determine whether their offers are preferable and within your intended budget. 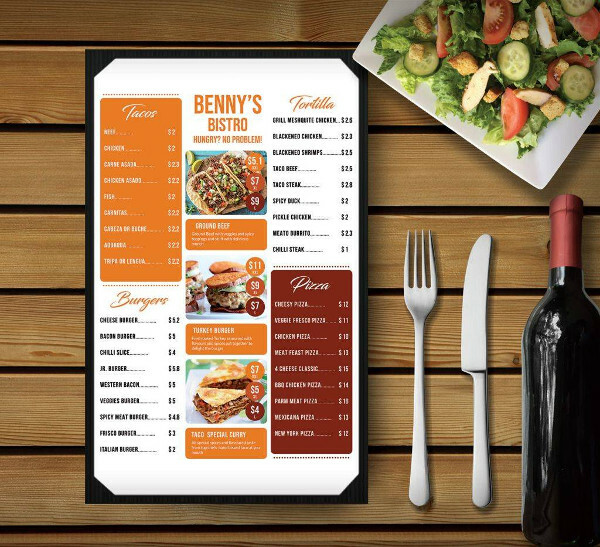 As a business owner, these restaurant menus can be used to attract customers and generate more sales. 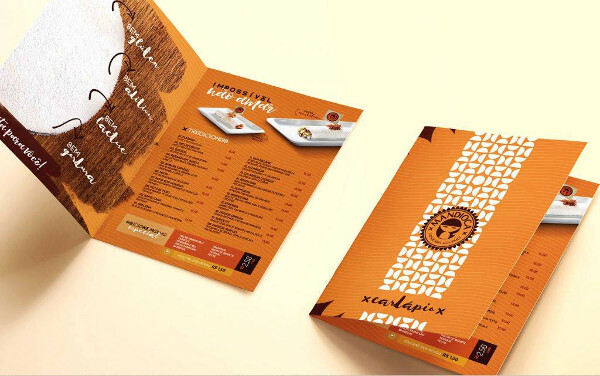 But for a menu design to serve its purpose, it must be tailored according to its exact function and target audience. 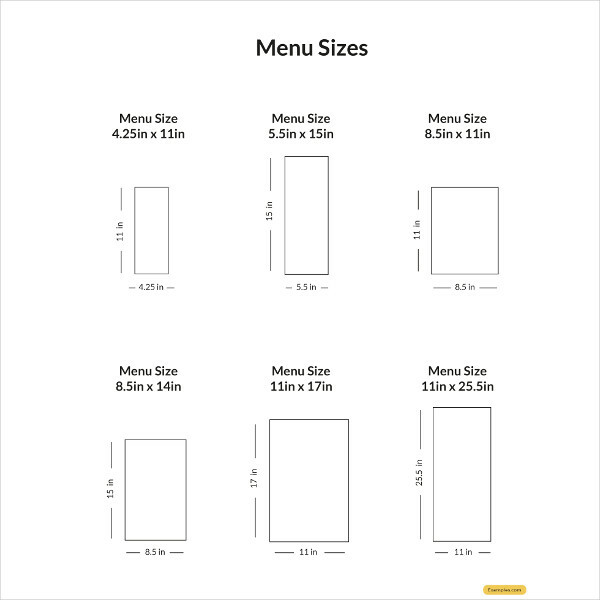 Just imagine if you made it difficult for customers to read or understand your menu. They could end up leaving your restaurant for a nearby competitor, or ask over a dozen questions, slowing your waiters down and preventing them from tending to other customers and work duties. 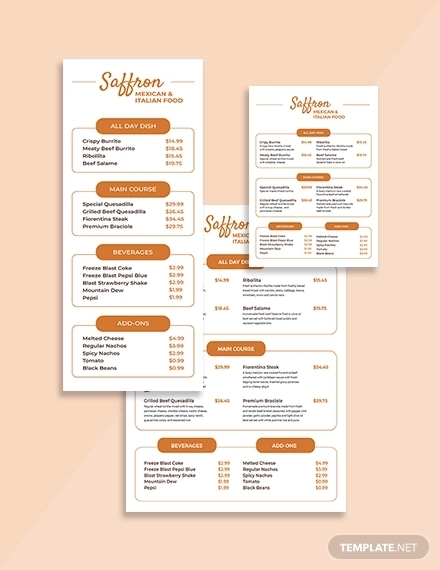 To avoid cases similar to the one above, the best you could do is to craft a menu design that is clear and well presented. 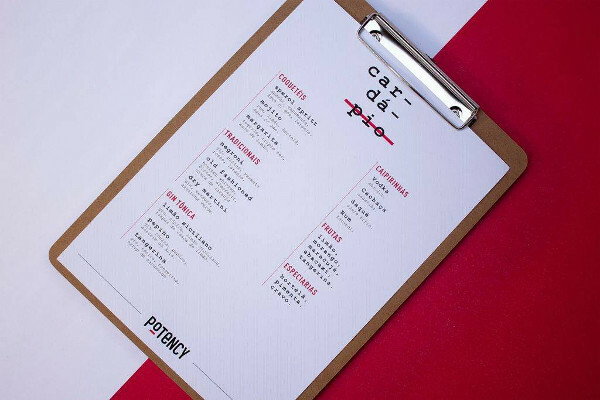 Readability: Perhaps the most crucial aspect of a menu design is its overall readability. 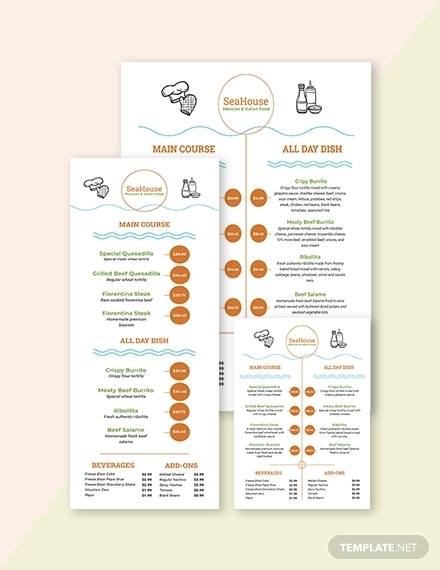 If customers find it hard to read and grasp items in your menu, they could spend most of their time at your restaurant trying to decipher what the menu is trying to tell them. 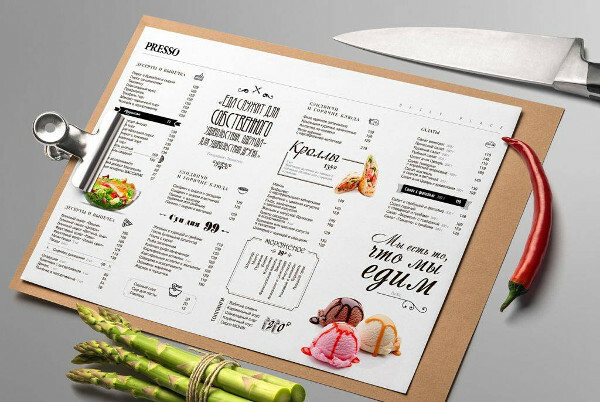 It’s important to use fonts that are easy to read, as well as a language that is vivid and appealing to make the menu understandable content-wise. Allure: There are many ways to make your dishes sound appetizing, mainly through enticing descriptions and mouthwatering images. Providing customers with a visual representation of your food and beverage items is a great way to paint a clear picture in their heads of what your business can offer. 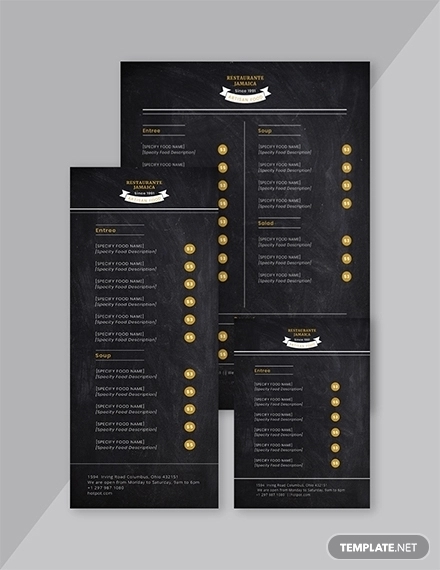 You can also make your food menu even more alluring by making it consistent with the overall theme of your restaurant. Variety: We all know how hard it is to decide what to order. For the average customer, seeing a wide range of food, beverage, and price options will be enough to keep a person fully engrossed in what you have to offer. It doesn’t have to be an overwhelming amount, as this can only prolong a customer’s ordering time, but just enough to appeal to a diverse set of taste preferences. Branding: Even businesses in the food and beverage industry need to know the importance of branding. 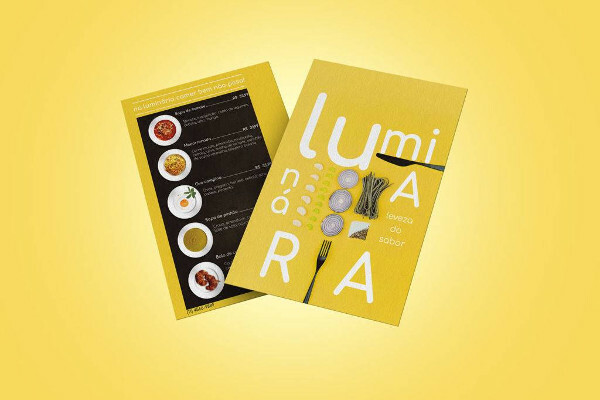 This is usually done by putting your logo design and restaurant name front and center of your menu. The idea is to build a distinctive atmosphere through your content to give your brand a voice that customers will remember you for. See what your competitors are up to. What can you do to top them? 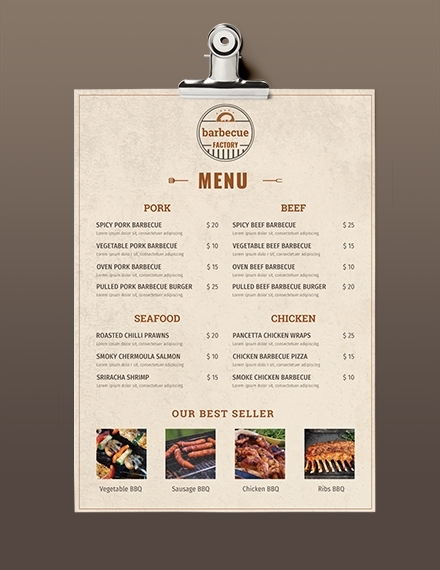 How can you boost sales on profit-driving menu items? While you can’t always garner accurate answers, conducting a thorough research on consumer demands and buying behavior will surely be helpful. 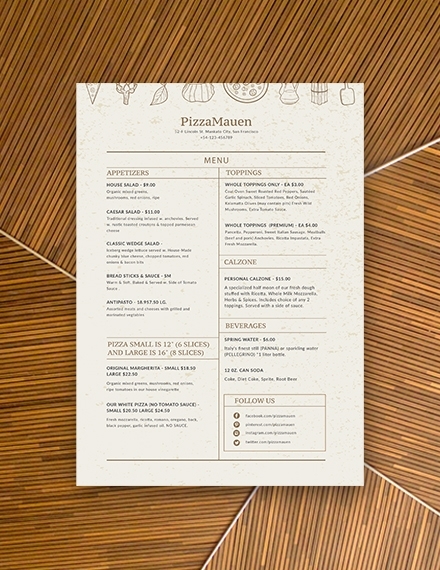 Create a menu with your customers in mind. You need to come up with something that your customers can relate to in terms of content, product offer, and price range. Decide on a proper structure for your layout. 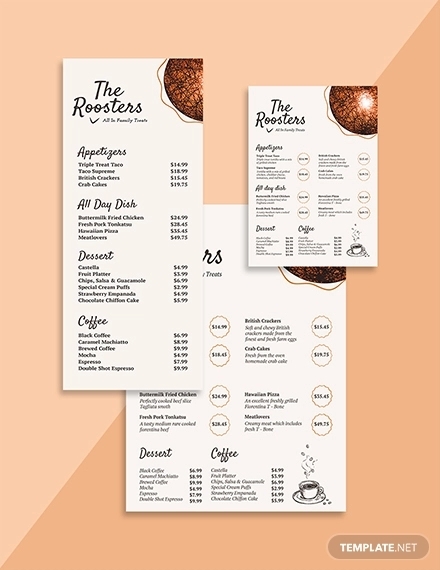 For example, since the upper right-hand corner of the menu is known to be the hot spot where most diners’ eyes are drawn to first, you can utilize this space for best-sellers or new product offers. 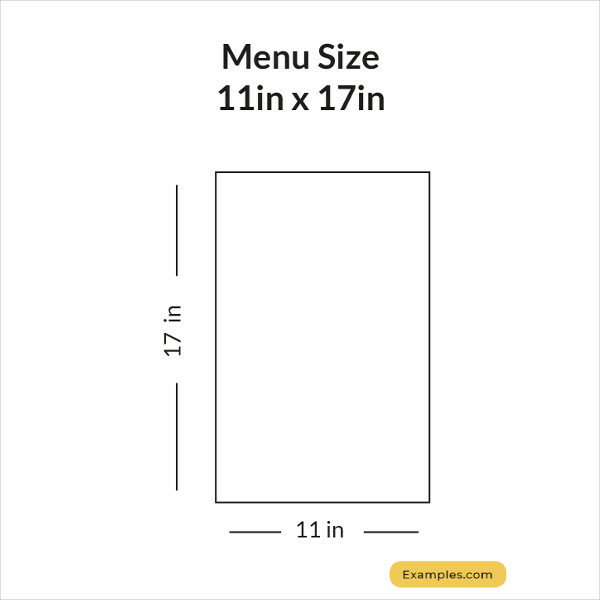 Make sure to sketch out the placements of these sections with a graphic designer before finalizing your layout. 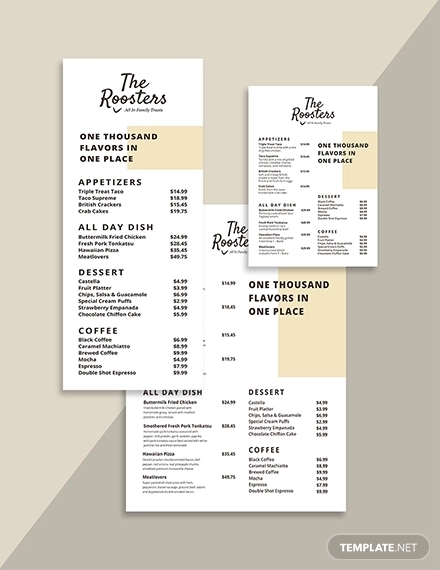 There are three factors to consider when designing your menu: usability, branding, and versatility. 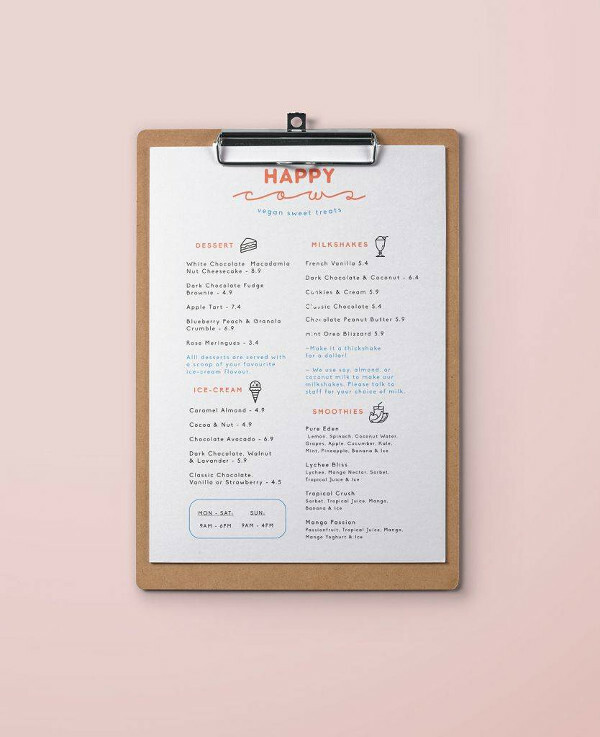 It’s not enough to make your menu visually attractive in the eyes of patrons, as you also need to be mindful of the message it conveys. 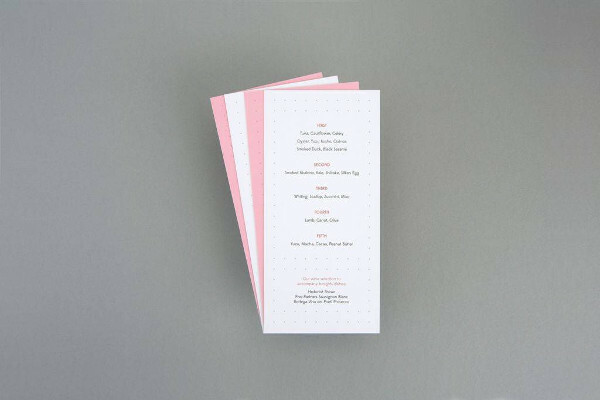 Printing menus can be pretty costly, which is why it’s important to get it right the first time. Check your menu for any grammatical mistakes and spelling errors that might put all your hard work and resources to waste. You can have at least four different people from your team review it for reassurance. 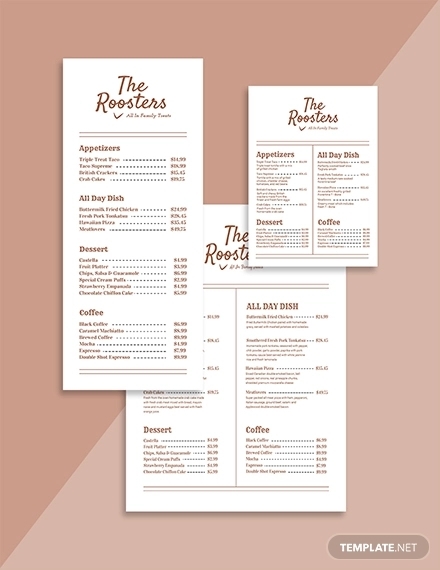 Have you ever wondered why most menu layouts are designed in a similar manner? 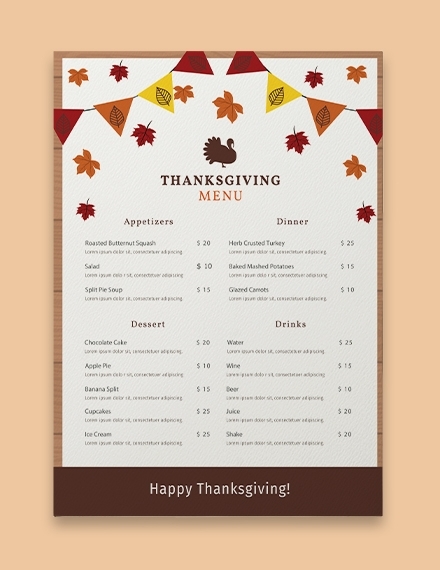 Can something as simple as a menu design impact sales? 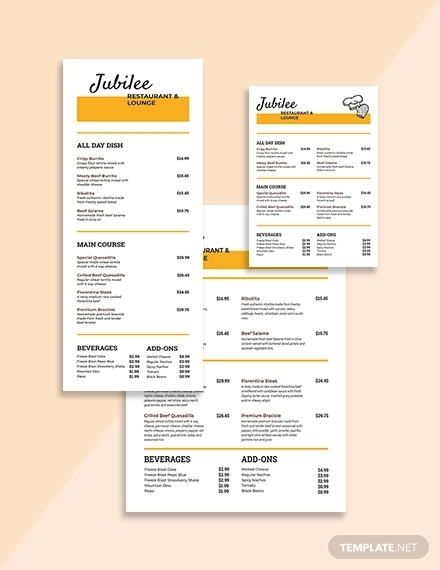 Creating a design for your price menu is a vital part of the food industry due to its ability to influence a customer’s perception toward your business and product or service offers. With that in mind, it’s important to pay close attention to every significant detail of your layout. Think of this as a food hierarchy. You have to take note of how people are bound to read your menu, along with the components they’re likely to notice first. It’s important to consider the natural progression of courses as well. It’s a good idea to construct a layout that follows the flow that mimics the courses patrons will order and eat in the chronology that is most commonly practiced. The magic of images will only work when applied correctly. The secret is to include images that were taken by a professional photographer, and to arrange them in such a way that customers will notice. Choosing food images that look tasty enough to make a person’s mouth drool when viewed is a definite must. However, as much as you wish to spike up sales, try to keep your food images as realistic as possible. The trick here is to prevent possible price comparisons between meal items. Otherwise, this could lead to an increase in sales on your least-profitable menu items. You can avoid price scans by excluding the dollar sign or any currency symbol on the menu. You should also avoid ranking items in price, or aligning them vertically or horizontally on your layout. 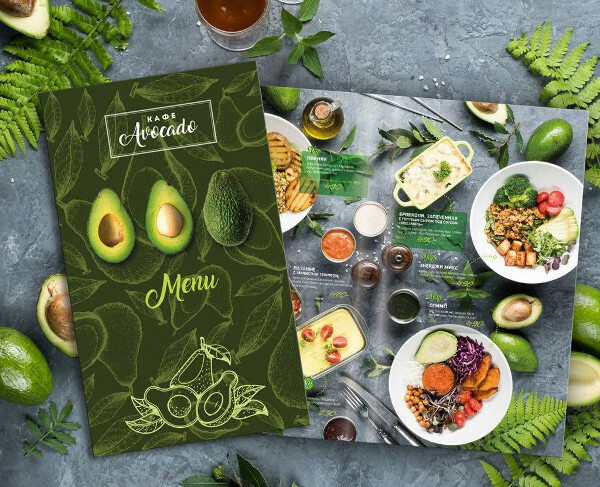 This doesn’t give you the freedom to transform your menu into a rainbow masterpiece, rather, it simply means seeing the value of color in both meaning and branding. 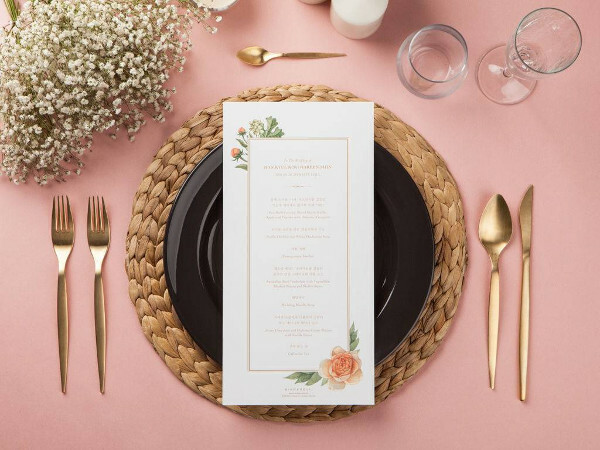 Though vibrant colors are usually a good option, an ideal color selection must depend on the type of restaurant being represented. 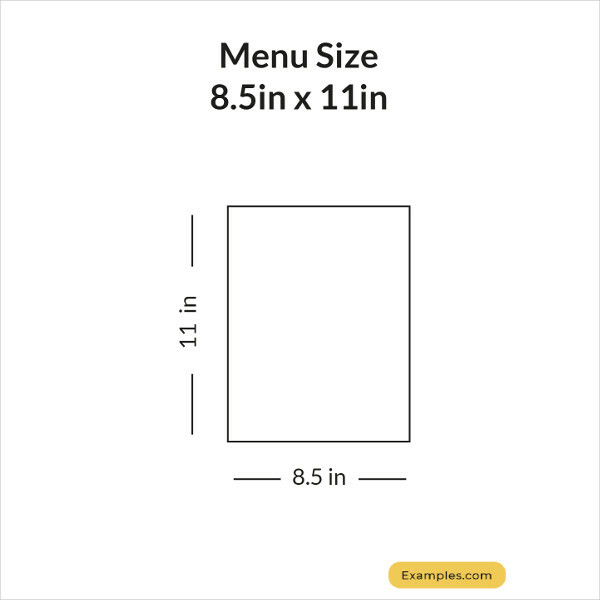 Avoid a cluttered layout by using lines and boxes to separate menu items. 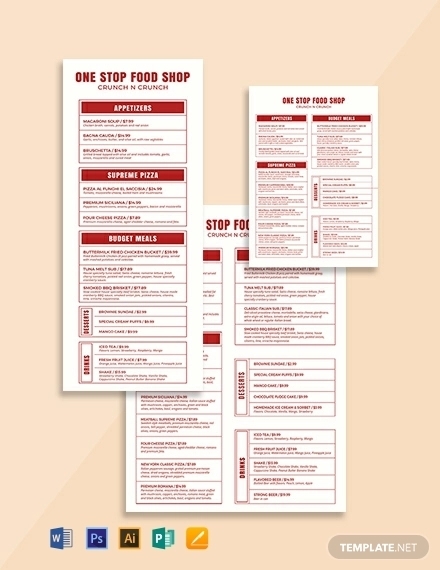 Considering the amount of information found in a menu, keeping it organized should be one of your one main priorities. You can even enclose certain items in a particular section to highlight the offers inside of it. The typeface and style you choose can greatly affect the readability of your text. It can also set the tone for your restaurant, complementing the type of atmosphere you’re working to achieve. Say for instance, using script is perfect for a classic and fancy kind of vibe, while an Old English or blackletter typeface is suitable for a more traditional look and feel. Some restaurants like to make their menu items sound fancy and sophisticated in an attempt to lure in customers. But this can also be quite tricky, since not everyone would assume that a Chèvre is a French term for goat cheese. 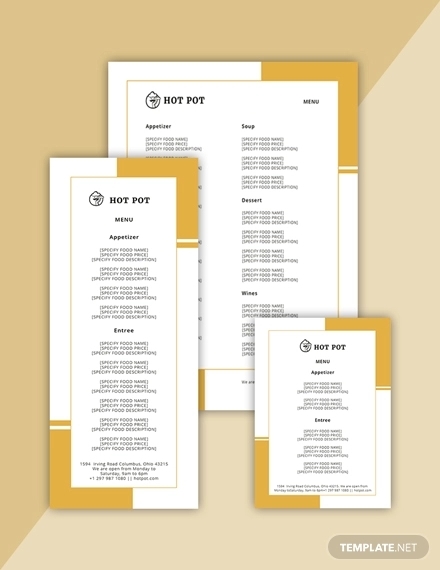 To avoid confusion and to save time for wait staff, including a descriptive or interesting copy for each menu item is recommended. 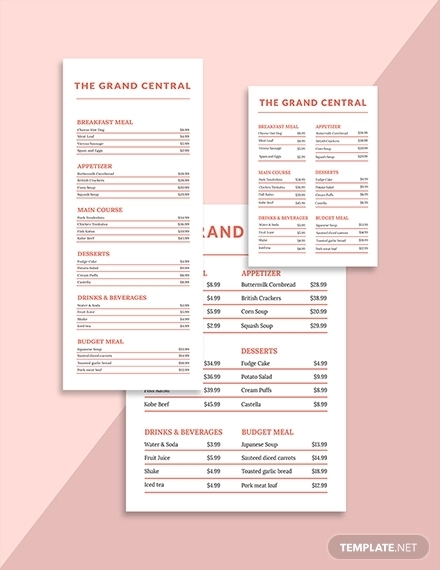 A la Carte Menu – In this menu type, each food item is priced separately. This usually offers a wider selection of goods for customers to choose from, with greater flexibility and value in terms of food quality. Although items are priced a little higher, being granted the opportunity to mix up your orders offers you a worthwhile experience. 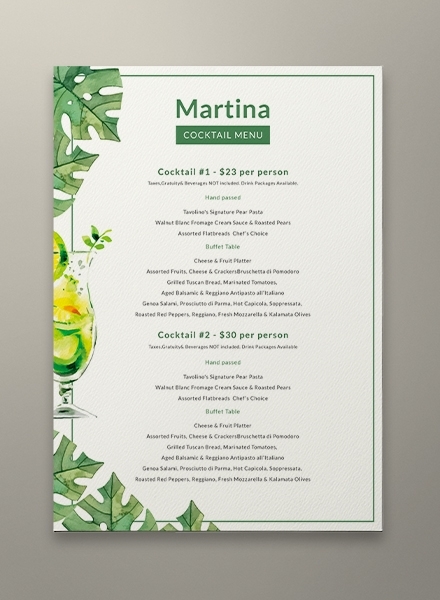 Beverage Menu – Many restaurants tend to keep a separate menu for their wine and drinks. 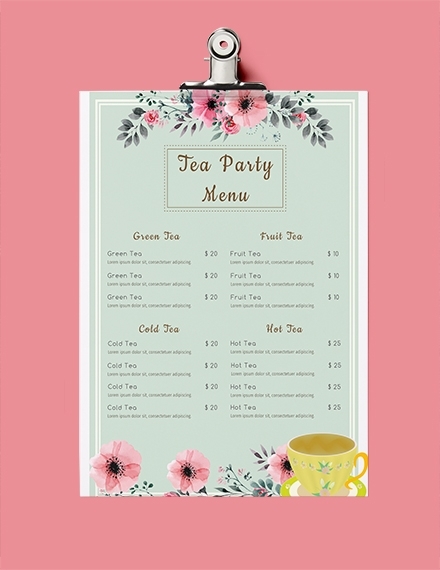 A beverage menu contains an assorted list of teas, coffees, cocktails, wines, shakes, and carbonated drinks for customers to choose from. This is most common in fancy restaurants, clubs, pubs, and bistros, since some patrons would rather drink than dine. 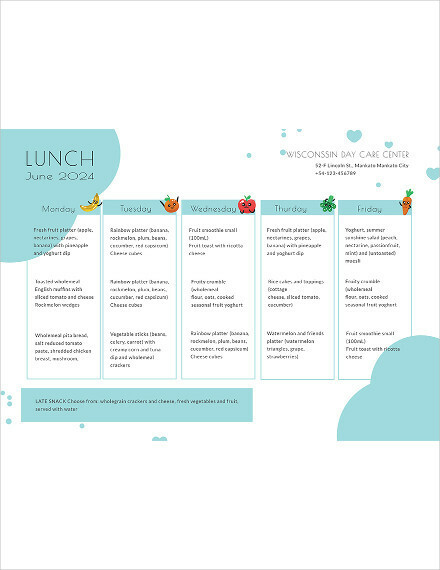 Static Menu – This menu carries food items that are made available all-year long. It is most prevalent in fast-food chains like McDonald’s and Burger King, since their menu items generally stay the same over the course of time. Du Jour Menu – For restaurants that like to spice things up by offering special dishes for the day, a du jour menu is a good option. 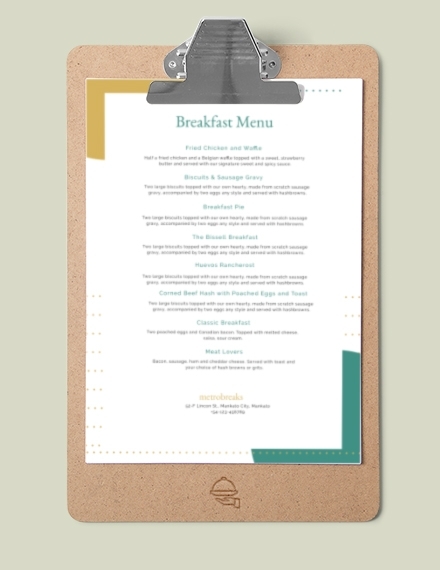 But instead of investing on a printed menu, most businesses tend to use a chalkboard menu for flexibility. This way, they could easily change the content of their menu whenever necessary. 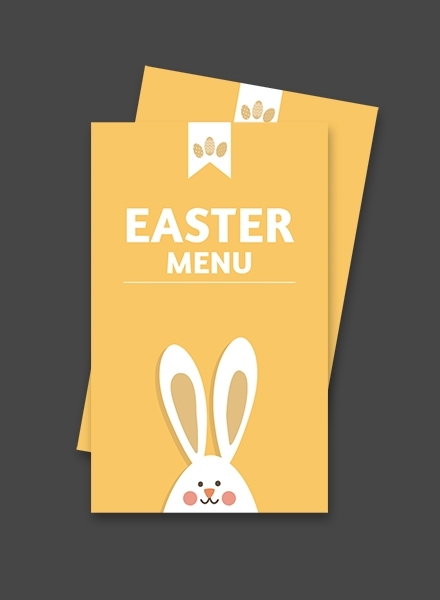 Dessert Menu – Although they may not be as common, creating a dessert menu is a great idea for restaurants that offer special sweets, cakes, and pastries that no other restaurant has. 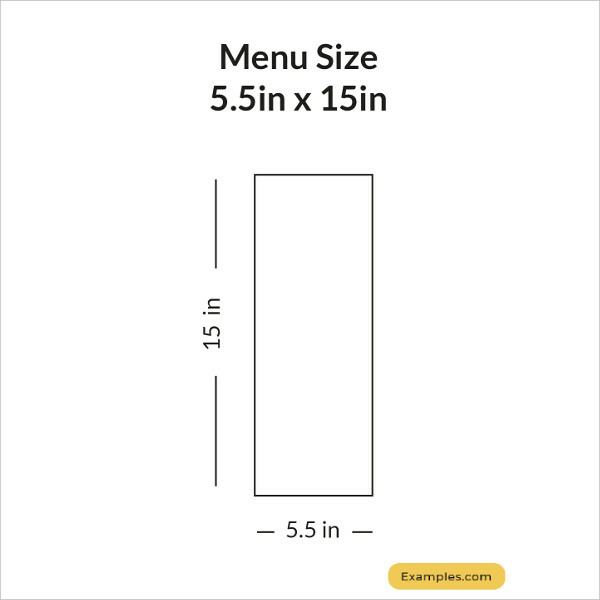 This way, you can emphasize your dessert items in order to encourage orders. 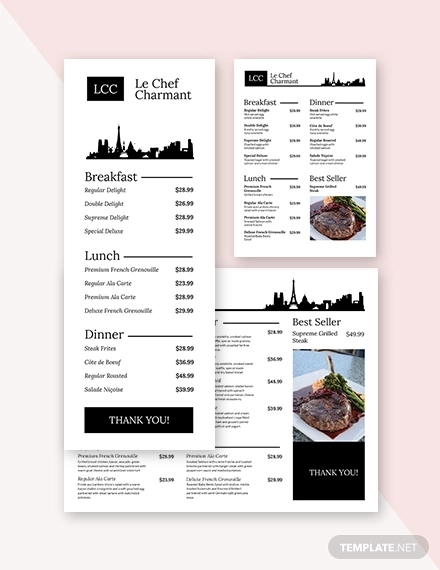 You can also opt for a customized menu size by collaborating with the printing company to obtain a more unique output. 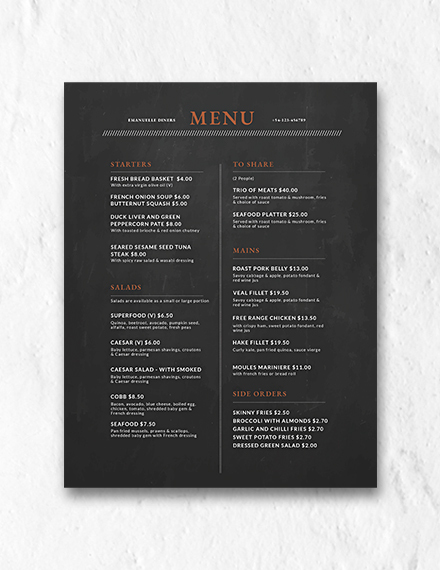 How can I make a menu? 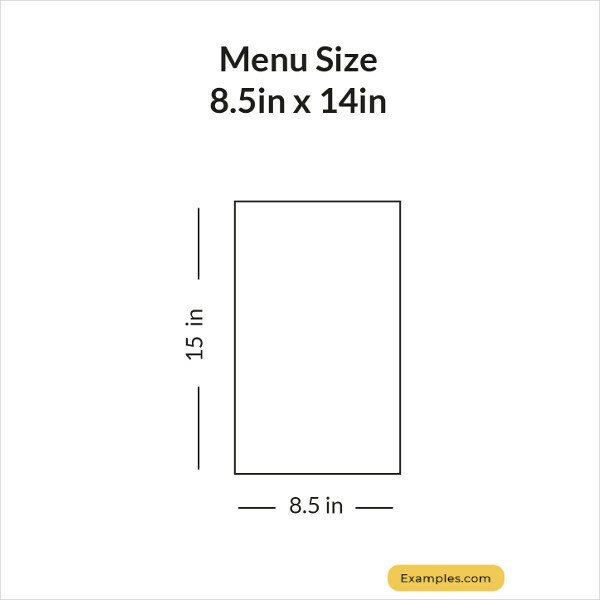 Creating a menu may seem like a daunting task for beginners, but it doesn’t have to be. 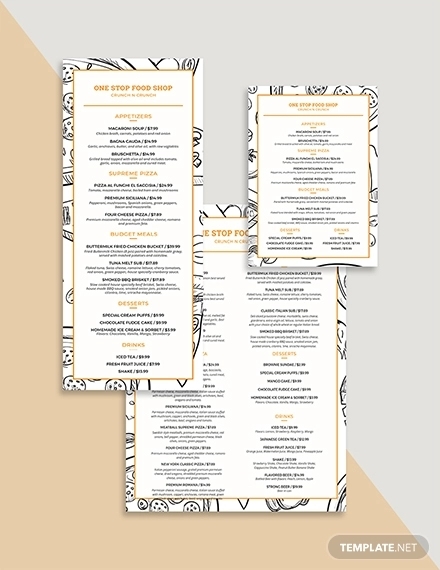 The key is to allow your creativity to run wild in order to achieve a menu design that’s worth remembering. 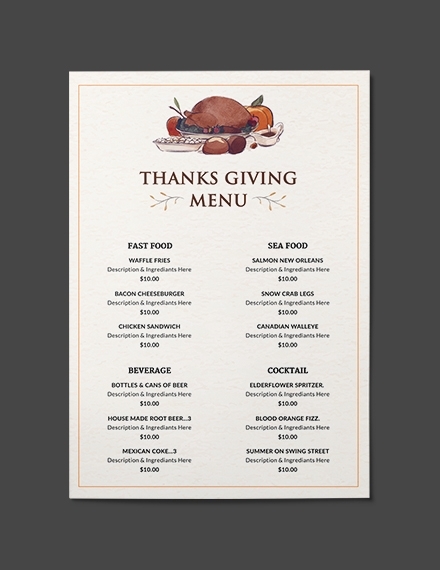 What type of paper is used for menu? 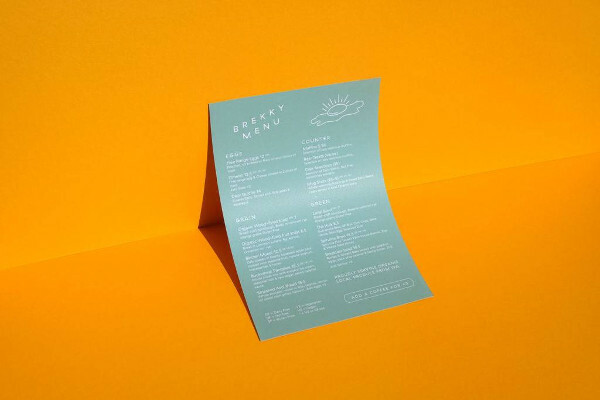 For a menu, you’d want to choose a durable and water-resistant material. Synthetic paper is a common choice, along with a gloss UV coating for extra shine and durability. It’s best to canvas on professional printing services to find the best and most reasonable-priced option as well. 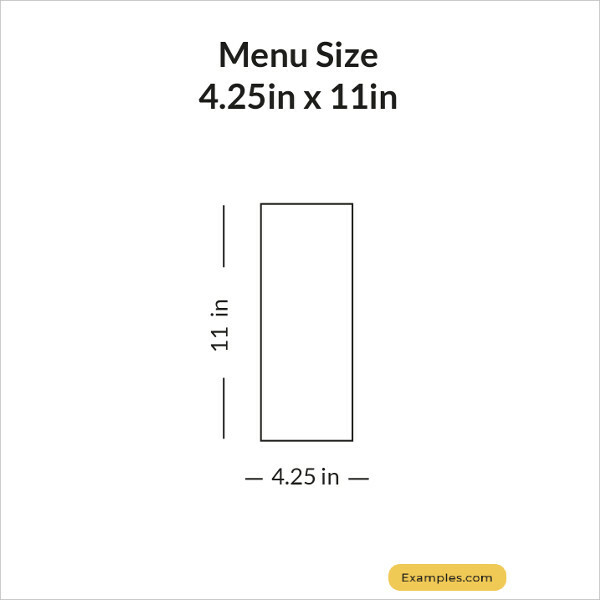 What is a menu used for? 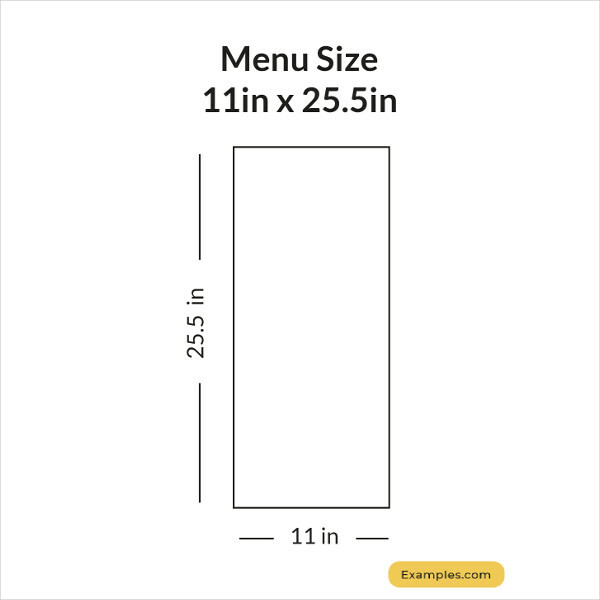 Why is a menu important? 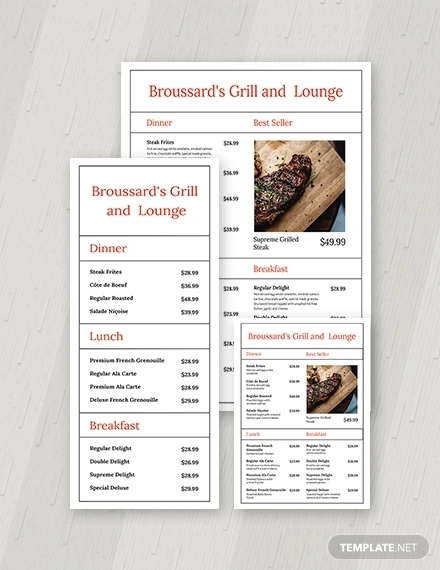 Can you imagine if a restaurant didn’t have a menu available for customers to browse through? It’s almost like playing a guessing game with a Q&A segment to find out what exactly they serve. Without a menu, it would be impossible for patrons to decide what to order based on what the restaurant has to offer. And there you have it! 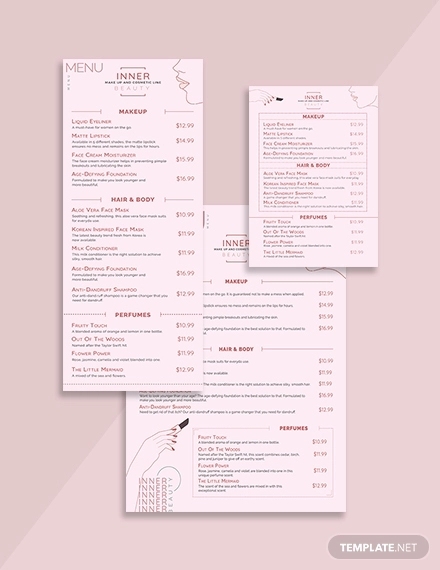 Menus play an important role in the restaurant business for a number of reasons. 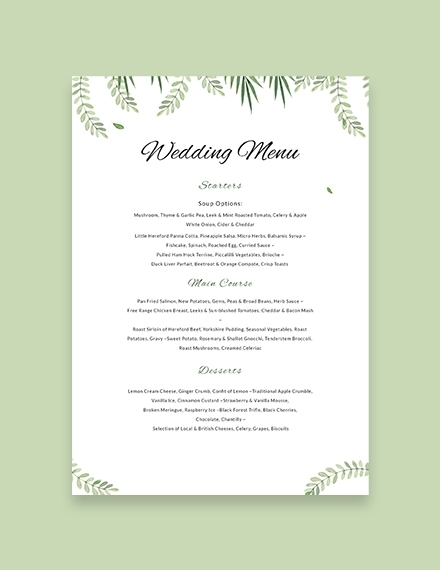 So if you find yourself in need of a good menu, you can refer to the examples provided in this article, or you can head on over to Template.net for more menu templates and designs to choose from.You may also see event menus examples.